NSK discovered that weld spatter and fumes were adversely impacting the operating life of the guide elements. The company therefore suggested replacing the existing guides with its NH series linear guides in combination with protectors and K1 maintenance-free lubrication units. Capable of providing long-lifetime performance in automated welding applications, the protectors effectively shield the sealing lip and prevent contamination from reaching the guide interior. An effect of the use of protectors is increased contact pressure between the rail surface and the seal. In this application, NSK also recommended the use of its K1 lubrication units, which allow the sealing lip to move at low friction over a film of oil. The K1 comprises a synthetic base material that holds the lubricant in its pores and extrudes it continuously, thus delivering maintenance-free operation. For additional protection, the surfaces of the linear guides were plated with black chrome to prevent the permanent adhesion of weld spatter. Spatter adheres only lightly to the plated surfaces and gets dislodged when contact is made with a protector. NSK says its NH series linear guide solution has solved its customer´s problem to its complete satisfaction. The C-type weld guns have been in operation for over three years without any failures. To date, this means that service life has been multiplied by a factor of 10. Henkel has announced it has produced an updated Maintenance Expert Guide to support LOCTITE products which offer maintenance solutions to keep plant and operations running smoothly. 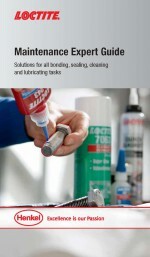 The company says this easy to use, pocket-sized guide offers quick reference via product category, such as threadlocking, gasketing, retaining, structural bonding, cleaning, lubrication and anti-seize and each product section has a how-to-apply guide providing useful application hints and tips.